Sometimes the best way to explore a new destination is to venture off the beaten track. When visiting the island of Sicily in southern Italy, it’s easy to spend your time in the main cities such as Palermo or Catania, but why not discover some of the island’s hidden gems instead? We dreamed a little and found the best ways to get off the tourist trail in Sicily. From exploring ancient towns to marveling at stunning Baroque architecture, or taking a dip in crystal clear waters on the island’s rugged coastline – there is a corner of Sicily for everyone. 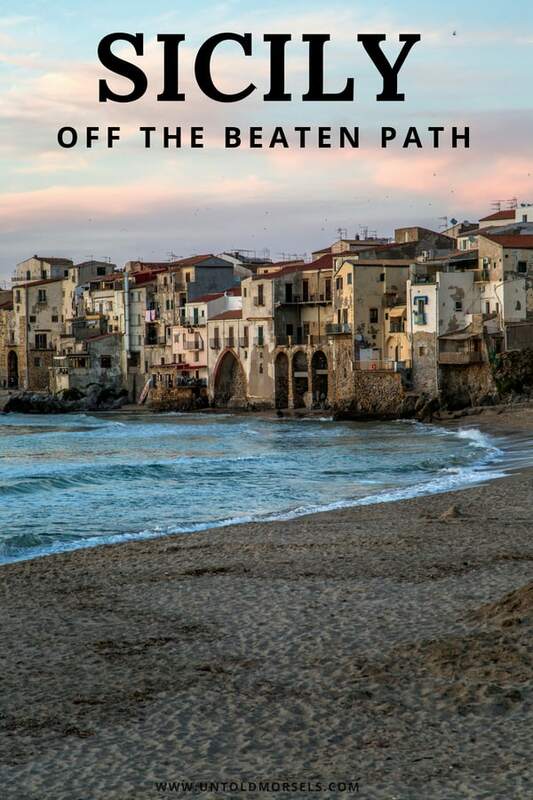 We hope you find some inspiration in our Sicily off the beaten track feature. Mozia is a beautiful island located just off the Sicilian mainland. Mozia is packed with ancient history dating back to the Phoenician times and it’s known as a top archaeological spot, once the most important Phoenician settlement in the Mediterranean. On the island you can explore the ruins, providing a very rare glimpse into one of the settlements of the Phoenicians. Be sure to head to the Mozia museum to find out more about the Mozia structures. Cefalu is a picturesque fishing village and is a great day trip from Palermo. The village sits on a hill slope that leads to the sea—a great place for hiking and soaking in the breathtaking views from the viewpoints above the town. It’s known for its Norman castle, an impressive 12th-century fortress filled with Byzantine mosaics. If you want to relax, head to the nearby beaches of Mazzaforno or Settefrati, encompassed by crystal clear waters. Enna in one of Sicily’s best-kept secrets. The city, which lies in central Sicily, is rarely visited by tourists, as most prefer to focus on the coastline or larger towns. It’s a truly wonderful setting, situated 3083 feet above sea level and filled with rolling green hills and tiny clusters of houses. From Enna you can see views of the mighty Mount Etna volcano, towering over the island. Top sights to see in Enna include the Castello di Lombadia, a medieval castle (one of the largest in Italy), and the ornate Duomo cathedral, where you can observe gothic architecture at its finest. Ortigia is a small island off the main island of Sicily, connected by a small bridge and just a short walk across the water from the city of Siracusa. Ortigia has ruins dating back to the Ancient Greek era and is known for its crumbling houses, beautiful balconies filled with flowers, narrow medieval lanes, and Baroque architecture. Ortigia is a small island and easy to explore on foot. Chocolate lovers rejoice! While Modica is known for its aesthetic Baroque architecture and delicious Italian food, it’s especially well-known for its chocolate recipe dating back several centuries. The chocolate is said to be made from a secret recipe, brought to the town by the Spanish in the Medieval era, who brought with them cocoa beans stolen from the Aztecs in Central America. The town of Erice lies on a hill 2460 feet above sea level. It’s known for its impressive Norman castle, Castello di Venere or ‘Castle of Venus’, built in the 12th-century on the site of the Temple of Venus, once a famous pilgrimage spot. Elsewhere, the 14th-century Chiesa Matrice church has been built from stones of the ancient Temple of Venus. Visitors can also see the remains of the ancient Phoenician walls in the center of the town. Ustica is a small, volcanic island off the North coast of Sicily, filled with beautiful, rugged coastlines and great snorkeling opportunities. The island actually sits on the tip of an underwater volcano and is subsequently known for its volcanic, black rocky slopes. The sea surrounding the island is a marine reserve and the waters are crystal clear, drawing a crowd of local divers and snorkelers in the summer months. It’s relatively unspoiled by tourism and is a great place to relax, explore deserted coves and check out the local marine life. The small town of Ragusa is arguably one of the most picturesque places in Sicily. The town was severely damaged in an earthquake in the 17th century and was rebuilt in two parts. The first part, Ragusa Ibla, was rebuilt with Baroque-style architecture and its original narrow, winding streets. The other part was built in a new style, with ordered streets. Top things to do here include visiting the ornate Baroque church of San Giorgio and the elegant church of San Giuseppe. Take a walk to the top of the hill for breathtaking views of the old town below, and afterward grab a wine-flavored gelato as you explore the town and its sights. Planning a trip to Sicily? Sicily is one of our favourite destinations in Italy, if not the world! Sicily has classic sights – Etna, Palermo, Catania and the gorgeous seaside town of Taormina. The food is incredible – try their delicious sweets! And there is ancient history seeping out of every corner. Carmela Rodriguez is a Journalist from London. She quit the rainy UK and moved to sunny Medellin, Colombia, where she is a Content Writer for Alltherooms.com.